Walk your dog in style with the Hyper Pet Retractable Dog Leash. This leash offers superior comfort and control with its ergonomically positioned braking button and constant lock lever. Your dog will love how smoothly the leash runs in and out so she can roam freely, and you’ll benefit from the soft grip handle. The inner spring mechanism keeps the lead under slight tension and the short-lift brake locks the leash in place for increased safety and control. 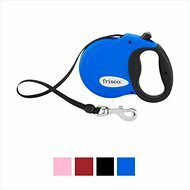 Perfect for the fast-paced city, this retractable leash will keep your dog safe and in control on your daily walks. Ergonomic soft grip handle is comfortable to hold for those long walks. Thoughtfully positioned braking button and constant lock lever give you total control with one hand. Runs smoothly in and out so your dog can roam freely and unrestricted. Inner spring mechanism keeps the leash under slight tension for total control. Pick the color that best suits you and your pup! 3 stars for the $5.45 sell price. The hook on the leash is hard to open up and clip onto an energetic dog. The handle itself is small and uncomfortable to hold. The handle has a button that you toggle back and forth. Doesn’t work smoothly, probably going to break soon. I liked that it extends so far and again it was less than $6. They are fine except you can not lock the amount of lease you want out. You have to hold down on the button and it's impossible to hold 2 in one hand and hold down the locks. Also the hold down locks are heavy spring loaded and you get tired of pushing that hard to keep it locked. I guess I will just tie the length off at the handle and be done with it. This is the best leash to pair with the martingale collar with buckle. These 2 items have been a blessing to me and my 65lb pit mix Diesel. He had a very bad habit of pulling during our walks but after only 2 weeks he is almost the perfect walking buddy. He still gets excited when he sees other animals or people but all I have to do is "put on the breaks" and he's back to the perfect pup! We bought this leash for our beagle/terrier mix (smaller in size) and not once did it "snap" but twice. Chewy.com graciously replaced it the first time but not sure I'd even bother with it a second time. This leash is great for my 8 pounder. She got too weighted down by some of the others. My dog is not a puller so this is perfect for her. 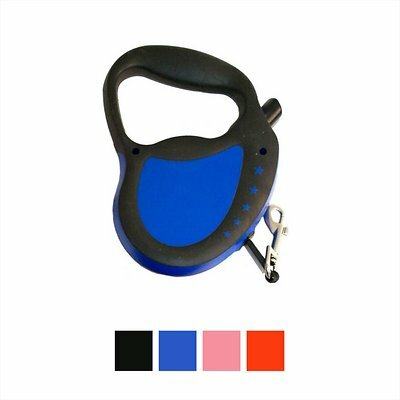 Several features of this sturdy leash contribute to the high rating. The handle is secure, and the locking brake is easy to operate. The length and width of the 16 foot tape is superior to any other retractable leash in this price range. Broke as soon as I got it. Would not retract at all! Very cheap quality. They should not be selling this item! I just threw it away. Not worth shipping back with all the trouble! Love that it’s small and works well. Would definitely purchase another if I get another dog.